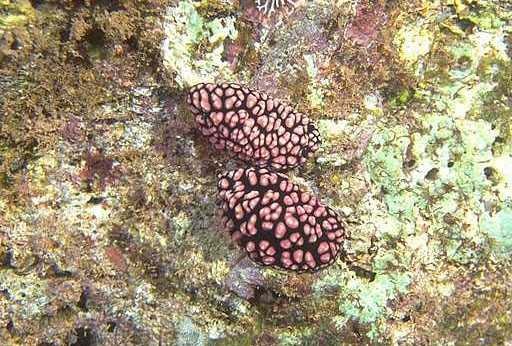 The black body of this slug is studded with pinkish nodules, which may appear green underwater. The second most common phyllidiid in Hawai`i, it sometimes occurs in areas of heavy coral growth and can usually be found along the coral-encrusted sides of the hot water outlet at Kahe Point, O`ahu. Typical of its family, it feeds on poisonous sponges, concentrating the toxin in its tissues as a defense against predation. The bright colors are believed to serve as a warning; as evidence of this, a dorid nudibranch and a flatworm that mimic this nudibranch occur in other parts of its range. The mimics, however, have not yet been found in Hawaii. To about 2 in. Indo-Pacific. Photo: Kahe Point, O`ahu. 20 ft.
John P. Hoover lives in Honolulu. He has published two books on marine life of the Hawaiian Islands. 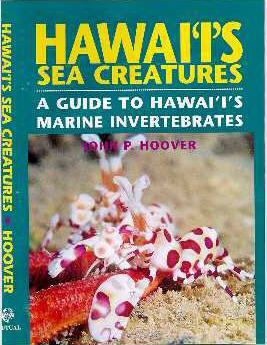 His third (pictured at left), a field guide to the marine invertebrates of the Hawaii, will be available approximately May 1999. With over 600 photographs, it will cover 500 species, including 66 of Hawaii's most colorful and interesting opisthobranchs.